If I have questions during my stay, who can I call? Our offices are open from 9:00 am to 5:00 pm daily and on Sunday from 10:00 am to 3:00 pm and we have an on-call phone for after hours emergencies. Guests may call us at 844-KW-SHORE. We ask that guests limit any after-hours emails to emergencies only. What if there is an emergency and we need service after-hours? Our homes are self-service. For emergency after-hour service, please call 844-KW-SHORE. If no one immediately answers, leave a message. We have staff on-call 24 hours a day, and they frequently check their messages and will respond quickly. Can we have guests over during our stay? The listed maximum sleeping capacity is the maximum number of people that can be in the home at any given time during your stay day or night. This is calculated based on the number of total people the home can sleep (double occupancy - two to a bed), including beds and other alternative areas to sleep such as sofa sleepers and futons. There are a few homes where there are more spaces for sleeping than the listed maximum occupancy. It's designed to allow for different sleeping configuration but is not intended to allow for more guests. How do I make a reservation? Is it secure? Booking a vacation rental with KW Jersey Shore Rentals is a fast, easy and secure process. Guests can view photos and amenities of each rental to find a home to fit their specific needs prior to booking. Reservations can be made 24 hours a day online at www.kwjerseyshorerentals.com or by calling one of our friendly reservation agents at 844-KW-SHORE. How do I check-in to my vacation rental? Approximately one week prior to your arrival date, you will receive an email including pre-arrival information, check-in information. Check-in time is 2:00 pm - 5:00 pm. Check-out time is 10:00 am. KW Jersey Shore is proud of the high standards of our vacation rentals, and in order to make sure there is time to turn the home over for the next guest, please be sure to adhere to the agreed upon check-out time. Many of our vacation rental homes do not allow pets due to allergy concerns. Rentals that do allow pets usually limit them to one (1) housebroken domestic animals (dogs) unless otherwise stated. A $150 minimum, nonrefundable fee is charged for each pet. Any pets must be approved prior to occupancy. A pet of any kind on the premises of a non-pet property is absolutely prohibited and is grounds for immediate eviction of the entire party. You can reserve your vacation rental for 30% down. Final balances are due 90 days prior to arrival. Guests should bring sheets & towels (unless you’ve purchased Linen Service), any soaps & detergents you may need, trash bags, and paper products (paper towels, toilet paper, napkins, etc.) Most kitchens are equipped with coffee maker, dishes, glasses, flatware, and a basic supply of pots & pans. If you have any specific questions about amenities in your unit, just call 844-KW-SHORE. What if I'm arriving late? 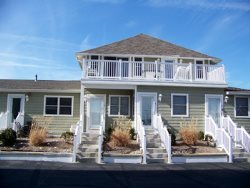 KW Jersey Shore Rentals provides after-hours access to guests via locked boxes located in our North Wildwood Office (200 New Jersey Avenue), Ocean City Office (1 Atlantic Avenue), and Wildwood Crest Office (5406 New Jersey Avenue). Please be sure to call ahead if you will be arriving after 5:00 p.m. so that we can make the necessary arrangements and ensure that your check-in envelope is waiting for you when you arrive. If for some reason you become locked out of your property please call our office for assistance at 844-KW-SHORE — a $150.00 lockout fee will be assessed for after-hours assistance and charged to the credit card on file. Will my Security Deposit Protection Plan fee be refunded to me? No, the $50 Security Deposit Protection Plan fee is non-refundable. This plan protects you for up to $1,000 in coverage against accidental damage to your property. However, this damage must be reported to KW Jersey Shore Rentals staff as soon as it occurs. Certain pet-friendly properties may also charge a non-refundable Pet Fee, while others require a separate Pet Security Deposit that is exclusive of the damage waiver/security deposit for the unit itself. Finally, there are select properties in our inventory that do require a traditional Security Deposit. This deposit is refundable to guests within 30 days of check-out, as long as the rental is left in good condition and there are no charges for excessive housekeeping or maintenance. What is the Damage Protection Fee & how does it work? Each reservation is charged a non-refundable fee of $50.00 for a Security Deposit Protection Plan (SDPP). This plan is designed to protect you from charges due to accidental damage only. The SDPP can provide up to $1,000.00 to repair accidental damages (beyond normal wear and tear). If any damages surpass $1,000.00, additional charges will be applied to the credit card on file and written documentation will be sent to the Guest of record. If damages are determined to be caused by the willful misconduct, misuse, or pets; the Security Deposit Protection Plan will be voided on the grounds of intentional acts, gross negligence, willful conduct by Guests or Licensee of Guests, or visitor. These occurrences will result in the Guests credit card on file being charged in full for any damages and management fees. The plan does not cover any additional management fees or fines. ALL ACCIDENTAL DAMAGE MUST BE REPORTED TO THE KW JERSEY SHORE RENTAL OFFICE BEFORE GUEST DEPARTURE TO QUALIFY FOR PROTECTION. If I accidentally break something am I automatically covered by the Security Deposit Protection Plan (SDPP)? No, A guest MUST REPORT any damage at the property during their stay to qualify for full coverage. If damage is discovered by Owner after departure the SDPP waiver can be denied. Please report any damage if it occurs.